I recently received a study from New York regarding lamps on the back of vehicles. As you may or may not be aware, both tail lamps and brake lamps are required to share the same color (red), even though the two lamps serve different purposes. and width. The functional purpose of brake lamps is to indicate braking." It would give following drivers two distinct messages: Yellow = Vehicle. Red+Yellow = Slowing/Stopped Vehicle. 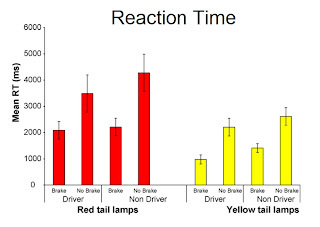 The study peformed measured reaction times (RT) of the two scenarios: red tail lamps vs. yellow tail lamps. Results indicated significantly faster reaction times when vehicles had yellow tail lamps. The study made me think about how this would affect colorblind drivers. When I (red/green CB) looked at the images in the report, I could see the yellow tail lights much better than the red. For me, red tail lights often blend into the vehicle itself -- especially during day or dusk conditions. But I was then concerned that the yellow tail lights might be too bright, and their presence would detract from the more important message the red brake lights provide: Slowing/Stopped Vehicle. To take it another step, for a driver with true color blindness I don't know that it would matter - if the brightness of the colors was the same. Just more to think about as the issue of color is addressed in the research community. Reference: McIntyre, S.E. (2008). Capturing attention to brake lamps. Accident Analysis & Prevention, Vol 40(2). pp. 691-696. 2) future studies on traffic devices, including those on vehicles, and how they affect colorblind drivers. Note that yellow lights are used in the front of the vehicle, so a switch to yellow tail lights must be carefully thought out as it may confuse drivers. You can't instantly tell which direction a car is facing. Adam - Thanks for the post. I hadn't thought of this, since I don't use color to make this determination (consciously or subconsciously). Cyclists with yellow rear lights would be easier for protanopes to see. Unfortunately, their selections are quite limited.